Arella is an outcast in her tribe, white skinned and silver haired, bright purple eyes and a strong will, while the others are dark skinned and passive. She longs to be free of the chains of society, but does not realize the dangers of this. Arella will soon come to find that the real world is not so easy to live with... 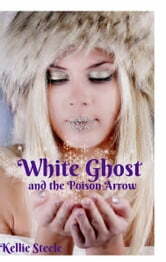 When she starts finding animals in the forest poisoned by arrows, she knows she must do something, but what? Will she find who is doing it? And will she be able to stop them without losing her own life...? 'The auron cat stands in front of Arella, big yellow eyes looking up at her and huffs. She is within touching distance, yet Arella no longer fears her. Arella drops to her knees and the auron cat is now taller than her. She looks the great cat in the eyes, and the cat stares back at her. Arella extends her right hand towards to cat. She pulls back slightly, looking at the hand, the presses her face into it, closes her eyes and relaxes. A flood of feeling pass through Arella. Her first though is that this is amazing. The power this cat possess is immense, and Arella can feel all of her strength and power in that one touch, but she is saddened by the knowledge the she will need to end the life of the beautiful creature. The cat seems to know this fact, and her eyes fix of the hilt of the dagger in Arella’s boot, then looks Arella in the eyes again. “You know I don’t want to do this right?” Arella says to the great cat. She just stares at Arella and purrs. Her purr is broken and stuttered. Tears begin to form in Arella’s eyes. “But what about your kitten?” Arella asks. The auron cat presses her face into Arella’s hand and something strange happens. Arella closes her eyes and an image appears in the blackness. Arella is holding the kitten in her arms and walking back through the forest towards her tree house. The image then changes and Arella is walking through the woods with that same kitten, except now the kitten is not a kitten but a full grown auron. When Arella comes out of the semi-dream the cat inflicted on her, she is breathless and dizzy. “You want me to look after him? Help him grow up?” Arella is confused. “But why me?” The cat does not answer, she only looks at the dagger with intent. A tear falls from Arella’s eye, wetting her cheek and falling to the ground. “I don’t know how to do this.” Arella’s voice breaks as she talks. The great auron cat seems to answer this question for her. She lies herself on the ground on her side and purrs softly.